I have a violent attachment to “my” chair at the kitchen table. Mr. R says that I am protective of my chair in a Big-Bang-Theory-Sheldon-y way. It’s a feature. When we had carpets with fringe on the ends, I combed out the fringe three times a day to “untangle” it. Doesn’t everyone do this? No, apparently it’s another feature. 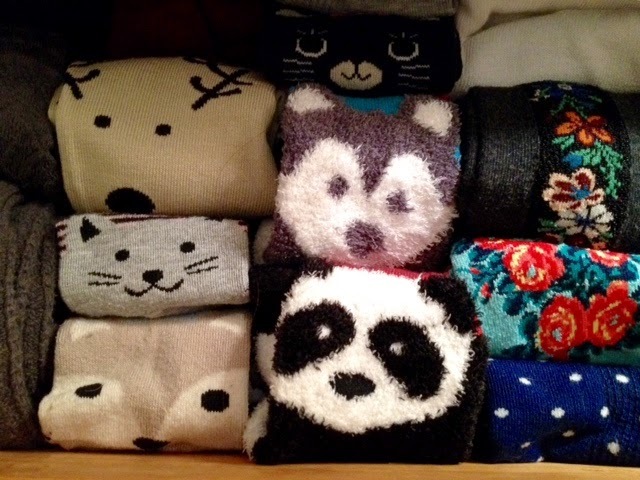 My sock drawer is organized so that the little faces on my adorable animal print socks are all adorably looking up. It’s a sock cuteness zoo. Fine. Feature. Back when I was a single lady, I kept a vigorously clean apartment, placing everything just so. Before anyone came over, I would mess something up a little so as not to appear as if I had pathologically cleaned the apartment. This of course is it’s own pathological situation. Yeah. Feature. I will only drink half a cup of coffee at a time. I may have four half cups (which is really only two cups) but the coffee will be from four different cups. Once the coffee is tepid, I’m out. And we have another feature. Do not like showers. Part of me is always warm while the other half of me is cold. I know, I know. Feature. I am always cold. I’m the one in the cardigan on a hot day. Mr. Rosenberg is always warm and insists on running the AC at all times. We’re really fun on a road trip. Feature. I face my bills in my wallet and keep them in order by denomination. This is something else I thought everyone did. Guess not. Hello, feature. I have hundreds of nicknames for my son. Feature. My hair and the chances that a situation will get my hair wet or turn it into a damp, frizz,y hair-pile influence my life choices. More often than not, I will get in the pool, but only up to here. I’m told this is a feature. How lucky is Mr. Rosenberg to have a wife with all of these fun after market extras? I tell him just how lucky he is quite often. I guess that’s a feature too. My friend Ann has her quirk manifesto on her blog today too. You can find it here. She is a quirky delight. I don't have that many pairs of cute socks (maybe one pair, actually), but I DO arrange the money in my wallet the way you do. THE WAY ALL PEOPLE SHOULD. Totally drink 1/2 a cup of coffee at a time for the exact same reason. Love this, as I knew I would. Can you come arrange my money and my rugs, please? If I had cute socks like those they'd be face up too. :) happy Monday! EVERYTHING sounds normal to me. Except for the extra clean part . That's never happened 'round these parts. My cash is similarly sorted, but also by condition. I unload the ratty/torn/worn out ones first. As someone who, given the choice between cleaning and stopping caring what people think, chose to stop caring, I love the fact that even super-clean people rearrange stuff before folk come round. And your sock drawer is cute. I love your sock zoo! I want one! I am impressed with your sock drawer. Clearly, I do not own enough animal-faced socks. So funny! I'm right there with you on the coffee and kitchen chair, Lisa! Everyone in our family has their sacred spot! In fact, we are buying a new, different-shaped dining table and I'm already wondering how it's going to rock our world.